Michael McFadyen's Scuba Diving - Dunbar The three masted clipper Dunbar was built by James Laing and Sons of Sunderland, England in 1853 for Duncan Dunbar. She was constructed from British oak and East India teak. The new ship was 61 metres long and 10.5 metres wide, with a displacement of 1,321 (or 1,800) tons. She had taken 16 months to build and cost £30,000. On her bowspit was a copper rampant lion figurehead carved by James Brooker of Maryport. At the time, she was the largest ship ever built in Sunderland. She did not immediately enter the London to Sydney run, being used at first to transport troops to and from the Crimean War. The ship presumably ran from London to Turkey or thereabouts. The first trip to Australia was in 1856. For some reason, the ship stayed in Sydney for three months. In May 1857 the Dunbar started her second and last trip to Sydney. On the night of 20 August 1857 the Dunbar was only a kilometre from the entrance to Sydney Harbour after sailing all the way from London. Carrying 63 passengers and a crew of 59, the Dunbar encountered a gale and poor visibility just as she approached Sydney Harbour. Just before midnight, Captain Green (who had skippered the ship on the previous trip) decided that the ship was six miles off Sydney and ordered the ship to head into the harbour. Soon breakers were seen straight ahead and it was obvious that the ship was not six miles off shore when she turned. Just after midnight on 21 August 1858, the Dunbar hit the coastline just to the south of The Gap on South Head. All of the 63 passengers died as did all but one of the 59 crew. The one survivour, James Johnson, an able seaman, was washed up onto the rocks and landed on one of the shelves. The next morning it became obvious that a ship had been lost, with wreckage washed up in Sydney Harbour. Bodies were found but no survivors. The bodies were buried in the cemetery in the grounds of St Stephen's at Camperdown. Today you cen see the grave site erected "by direction of the government" in the back left corner of the cemetery, along the fence. Look for the large anchor. There were some terrible loses, whole families wiped out, Kilner and H. Maria Waller and their six children aged from 4 to 13, Abraham and Julia Meyers and their six children, Daniel and Elizabeth Healing and their three children, James and Eleanor Clarke and their two children, all dead. There were other families who suffered multiple loses, but none as bad as these. On 22 August 1857, more than a day after the wrecking, James Johnson was spotted on the rock shelf below the cliff top. He was rescued by Antonio Woollier who was sent down on a rope. Johnson was unharmed and later on he became coxswain of the harbour master's boat at Newcastle, New South Wales. He went on to become the lighthouse keeper at Newcastle and on 12 July 1866 he helped rescue victims from the Cawarra disaster (as the coxswain). In 1902 it was reported that he lived at Petersham. It is also reported that on 24 August (I have also read 24 September) 1857, 20,000 people lined George Street for the funeral procession. In 1910 anchors, chain and some coins were recovered from the wreck site (one anchor presumably put at St Stephen's as above) and in 1955 scuba divers started visiting the wreck. Many artefacts have been found over the years, especially in the 1950s and 1960s. 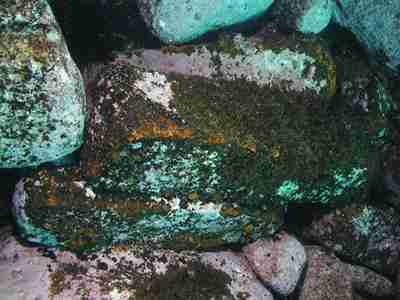 Today the wreck of the Dunbar consists of not much more than scattered remains. The wreck is located to the south of The Gap, just before the next small point, in the little inlet. The GPS Reading is 33° 50' 59.5"S 151° 17' 12.7W (using AUS66 as a datum - see my GPS Pages from menu at left for what this means). The wreckage is in 4 to 7 metres. You need absolutely flat seas, with winter westerly winds the best. Anchor away from the shore and swim in. You should see pieces of wreckage almost immediately. There are iron ballast blocks, dozens and dozens of them. As well, there is a lot of copper sheathing (that used to cover the timber hull) and plenty of other bits like a swing anchor, chain, sections of masts and other things. In between the boulders (and under them), you will see fragments of bottles (green, black, clear, blue and other colours) as well as pieces of china. These are all covered with ornate decorations. The ship was carrying a considerable amount of gold coins and these have been found over the years. There are also pennies and tea tokens (like copper coins, penny size) to be found. There are also two anchors located to the north of the ballast. Of course, this ship is protected and it is illegal to take anything off the wreck. Note that there is a lot of kelp on this site and when it is there, it is very hard to see the items on the bottom. An interesting dive in calm seas. The worst shipwreck in NSW history, total loss of 121 lives.